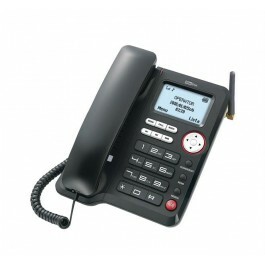 A GSM 3G fixed telephone is ideal if you need a line fast, without waiting for Openreach to install a line. It also offers a far lower monthly rental cost, as you can use ether a PAYG or contract SIM card. Fixed GSM Phone Maxcom Comfort MM29D 3G Black with Mobile Phone Function and Radio FM Simple landline you can connect to the mobile network, without the need for a normal telephone line. The large buttons, the bright and readable display makes it easy to use either in the office or at home. The device works only with a FULL SIZE SIM card and supports the SMS function. Operate with AC and also 600 mAh battery with 120 hours standby time and 2 hours of talk time. Choose your SIM Voice Tariff - We offer both O2 and Vodafone contract SIM cards, each with included UK calls. However the phone will work on any PAYG SIM card, which will give you full control over running cost. The only downside to using a PAYG SIM is you will need to remember to top the SIM card up each month. If you are looking to use a PAYG SIM we would recommend Giffgaff, as you can setup the account with them to auto renew the call plan each month. month from your credit / Debit card. Please Note - This is a GSM phone, thus the inbound telephone number will be a mobile number that provided by the SIM card mobile operator. This will NOT be a local or national telephone number. Warranty: 24 Months Replace/Credit from date of purchase providing the warranty has not been invalidated.